I am juggling between watching the movie “R.I.P.D.” and writing this blog post when it struck me that I should adopt the same title here. Just two weeks after Microsoft announced its acquisition of Nokia’s Devices and Services business, Research in Motion is writing down almost a billion dollars for its smartphones that lost charisma among consumers. Almost everywhere, RIM is considered “unofficially” dead. Nokia and Blackberry: the two biggest brands before the iPhone era. Taught fingers how to do the talking. Left the world with a million fingers talking about them. Nokia and RIM could have survived if not for being too self-consumed by their own respective “mobile phone world.” Apple went out, proved to be, and remains to be the differentiator. RIM panicked in 2007 after the first iPhone was launched but was too confident that Blackberry’s business users would stick to the email-focused device with an exclusive messaging service. It was too late for RIM to realize that sales would be driven more by apps than by hardware features. Before it decided to let go of the physical QWERTY keypad and make the BBM application available to iOS and Android users as well, RIM’s market share has sunk to unrecoverable depth. Nokia was too confused which way to go. It got rid of Symbian OS in favor of Meego. After creating one great Meego phone, it went for Windows while the rest of the non-iOS world moved to Android. Unfortunately, these wrong moves were lethal for Nokia and RIM. Those who are afraid to die have been keenly looking at Apple. Google bought Motorola. Microsoft got Nokia. Apple made them realize that it wins by taking full control of the hardware and the OS. Now, Samsung is reported to be porting all its future devices to its own operating system, Tizen. It’s arguably built out of fear as Google has started creating smartphones with a proprietary version of Android. Each of these tech giants are not myopic about innovation. All of them have made their marketing teams a lot of things to brag about. But the primary success factor in the mobile device industry in the last few years has been consumer-conscious innovation. It is delivering new ways that enhances how consumers use their devices, not just new technologies to bluff about which in the end do not get utilized at all. The competition keeps getting more exciting. Two down, and more to go. Hey Samsung, how’s Tizen doing so far? Make sure it’s not a re-branded Bada or else you’ll be next in the RIPD list. For two weeks now, I’ve been hearing (and reading about) the decommissioning of Red Mobile. Its subscriber base of around 900,000 (was 1.4 million in 2011) is now being migrated into Smart’s mobile network. It’s sad to see that this is how the story of my preferred mobile network brand ends. From an ambitious startup as CURE in 2001, it was one of the first 3G network service providers in the Philippines. It was supposed to run as an ad-supported mobile platform (see my related post here) but this non-traditional strategy did not work. Rebranded as ümobile, it was acquired by Smart Communications in 2008 with the latter’s plans of expanding its 3G network. It was later relaunched as Red Mobile with very affordable call and text messaging rates. I am using a Red Mobile SIM since mid-2009. I even got a 3G Motorola phone at half the price when Red Mobile had a promotional sale in Davao City then. Its prepaid services and rates have always been better than Smart or Globe whether postpaid or prepaid. That was until its conversion into a 2G-only network that resulted to end of support for data services including mobile internet and video calling. Now, Smart has stopped selling new Red Mobile SIM cards and Red Mobile’s 3G frequency franchise will be turned over to the government. It is apparent that Red will face the same fate as Addict Mobile had a few years back. Well, that’s the way business ventures work. If it won’t generate revenue, it won’t attract any business interest. PLDT and Smart’s focus now is on Sun Cellular. But I won’t mind it much. Whatever happens to my Red Mobile number, I’m sure to get better mobile services in the years to come. I woke up this morning with Microsoft splattered all over my news feeds. They all glorify the upcoming Surface, a Windows 8 tablet for which the hardware is also created by Microsoft. Digging deeper though, it’s all publicity and media hype for now. Surface is being positioned as a direct competitor to Apple iPad. Unfortunately, it was announced when Microsoft cannot even tell when it will become available, how much it will cost, what it can actually do, and how it will behave while running applications. Nothing was said about detailed technical specifications, battery life, readily-available apps, and everything else that matters to tablet owners and prospective customers. That’s completely contradictory to Apple’s strategy of keeping it secret until it comes up with a finished product that is ready for delivery. Microsoft describes the Surface as a “tablet that works and plays the way you want.” Well, that is if you’ll have the applications that will let you do so. Remember that Apple does not win by device and OS alone; it has the best apps store! One advantage that Microsoft has is that they did not make Office apps available for the iPad. They can make Office exclusive for Windows tablets but that may not be a significant leverage nowadays. Promising to deliver: Is that all Microsoft can do now from all those years of leaving Apple take away their market share? Good luck! Here’s a teaser video by Microsoft. See if it will buy you in. Life is what we make it. This has long been my conviction that makes me feel accountable for the dilemma I am facing right now. I’m already 21 but still an undergraduate. After having spent six semesters in UP and reaping a handful of failing grades, I left the country’s premier state university. I spent twelve relaxing months sulking in the comfort of my family’s home without anything to do aside from occasionally visiting our farm, surfing the Internet and watching VJ Heart Evangelista on Myx. For one whole year, I enjoyed and never longed for the tranquility of life and the unique panorama on the threshold of Mount Banahaw. Later on, because of people and events that seemed to conspire in compelling me, I realized that I had to go back to UP and be an Iskolar ng Bayan again. It’s not that I was sick and tired of the countryside life; I just had to ascertain if I could get up where I fell down. Returning to the institution I abandoned before was more difficult and challenging than chanting “Open Sesame!” a thousand times. It took me triple my pre-college “admit-me-please” effort to convince UP to accommodate and give her prodigal son a second chance. This therefore verifies the cliché that trying to be admitted to UP is tough, surviving as a student is tougher, and attempting to graduate is the toughest. I am optimistic though that I can make up for my failures on my second try in the university. I know that nothing much has changed in the institution I am returning to — including the brain-whacking academics — but I am better equipped now, prepared to exhaust all possibilities and not to settle for mediocrity as I did before. When I was still in high school, I thought college life would bring me self-fulfillment, grant me independence and magnify my self-worth. It gladly did. But the side-effects are more potent, more obvious and somehow painful. My limitations were uncovered and my weaknesses were exposed. All in all, college life made me realize that my intellectual armor is not bullet-proof. When I learned the tricks of the trade, I was already far down below. I still remember (and will never forget) when my high school music instructress wrote me a letter on my first month in UP reminding me that, besides other things, I should keep counting my blessings and thanking God. Let me do those now. Yes, I always got first honors from elementary to high school; I got 18 gold medals for academic achievements, 16 of which are gold; I was admitted to UP where I was granted two simultaneous scholarships; I can design webpages and do some computer programming; I eat three meals a day; and I have the most supportive parents. And I really thank God for these. But look at me now: I won’t graduate on time nor with flying colors as most people from my hometown expects. My medals stopped accumulating. One of my two scholarships was terminated due to my academic skills downgrading. The meals I am eating don’t seem to compensate for the weight I am losing. Worst, there is no guarantee that my parents (or I myself) can financially support my studies until my diploma sees the light of the day. The alerting sound of an alarm clock and the voice of the pandesal vendor bring me to the starting line of yet another day’s academic version of a Formula 1 race, without ever expecting a second runner-up trophy. For sixteen years since birth, I was the king of the hill. The world used to go around me. Things could happen at a flick of a finger. I could bravely face the mirror and see someone confident and respectable standing before me. Now, I realized that my life is not all about getting high grades, winning competitions and garnering gold medals. Unfortunately, I learned this lesson the hard way. Like a house that needed renovation, I had to look uglier before I could look better. But there is not even a slightest regret on my part. UP was my only choice when I was about to enter college because of financial consideration. It proved itself to me that it must be my only choice then and now. Amidst all the discouragements that are coming my way, I can’t help but miss the adventurous high school days I had. I wish I were still in high school where I was carefree and lighthearted, not worrying about which subjects to enroll, who my Math teacher would be, what books to buy and how my parents would react when they finally got hold of my class cards. I wish I were still in high school where I could top exams even without actually taking a glimpse of my lecture notes. I wish I were still in high school where despite being the Science Club president, the school paper’s editor-in-chief, the class president and a CAT officer all at the same time, notwithstanding my hosting of quiz bees (sometimes also competing in them) and of other school events like Christmas parties and Junior-Senior prom, I nevertheless found time for academics. I wish I were still in high school where garnering as many as nine gold medals in a year was as easy for me as merely being who I was and doing what I could normally do. I wish I were still in high school where I would be the least bothered when the principal or the Home Economics teacher would suspect and ask me if I was courting or the boyfriend of so-and-so because she was leaning and resting her head on my shoulder during class hours. I wish I were still in high school where I wouldn’t mind revising an essay ten times just to make it qualified for publication in the school paper. I wish I were still in high school where I was not taught Microsoft Windows yet managed to encode research papers with WordStar and NewsMaster and to print them using a noisy dot-matrix printer. I wish I were still in high school where I wouldn’t have to attend the exhausting ROTC drills and to shamefully don a muddy “Type A” uniform while riding public transport on my way home. I wish I were still in high school where I could boast of my trademark self-esteem and wouldn’t feel slapped whenever someone asks me if I’m in the Dean’s list or when I’m going to graduate. I wish I were still in high school where I was enthusiastic and always looking forward to every tiring yet fulfilling school day (“Carpe diem” was my motto back then). I wish I were still in high school where I was not worried about what the rest of the world expected from me. I wish I were still in high school where I was who I still am except that I am now wishing for impossible things like these. Of course, I do wish I were through with my bachelor’s degree. After the rocky detours that I marched upon, I hope that my remaining months in college will be a smoother voyage. Be it smooth or rough though, I will try to appreciate or at least not take it for granted for I know that later on in my life, I will also miss my college years. After all, there’s more to love in college life. I don’t want to miss the sights. Note: I wrote this essay in 2002 when I was on my survival years in the University of the Philippines. This is the first time I’m publishing it though. This is my book review of Alfred Slote’s Finding Buck McHenry. I wrote this back in 2008. I like best my last paragraph here. Most of us see life as a search for meaning, a realization of dreams, and a journey to self-completion. Gifted with innocence and armed with enthusiasm, we pipeline our vision toward a masterplanned future. But in the event of downfall, we usually tend to forget that for as long as we are alive, every point in our life is a starting point. Nothing is too late to do or to change until we lie on our death bed. This is one of the biggest lessons that I learned from my favorite childhood book, Finding Buck McHenry. Alfred Slote specifically wrote Finding Buck McHenry for youngsters aged 8 to 12 but his novel continues to own me until now in my mid-20s. The story begins with eleven-year old Jason getting cut from his baseball team. He was tasked to form a new team with other “reject” players from different teams in the Little League. Jason was emotional at first but being a baseball card collector, he found refuge in peeking at new cards. He was even delighted when he came across a rare Buck McHenry card. The card says that McHenry was a known pitcher decades ago. He won over 90 games in three seasons but quitted early from baseball and worked as a school janitor after committing unlawful offenses. It could have been just another card for Jason had he not meet Mr. Mack Henry, the old custodian in his previous school. For Jason, everything linking the two was implied but never spelled out. So he pursued Mr. Henry to be his new team’s coach. Jason couldn’t get Mr. Henry to confess his “McHenry” past at first. But the custodian later gave a condition: if his grandson would play in the team, he would coach it and admit the truth. The next things happened to Jason’s favor. The plot reminded me of my childhood feats and misadventures, carefree curiosity, and the luxury of making things happen as a prize for persistence. I somehow see myself through the pages of the book playing with the paradoxes and compromises of a child’s life. Upon Jason’s notice, the new league director who is also a sportscaster quickly set up for a televised game and interview with Mr. Henry, knowing that uncovering an old famous player would be a scoop. But Jason could not recruit any other players since Mr. Henry did not want others to know beforehand about him coaching the team. In the end, there were only three in the new team: the custodian’s grandson, the sportscaster’s daughter, and Jason. During the interview, Mr. Henry hesitantly narrated his life before leaving his baseball career and how he became a school custodian. As the TV crew continued taping, he went on to coach his three-player team against Jason’s former teammates, surprising everyone when the former beat the latter. But the supposedly happy ending got preempted. The sportscaster’s daughter and Jason later overheard Mr. Henry crying and confiding to his wife about the pretenses he did in the interview telling his own stories as if they were McHenry’s. They realized he was not really Buck McHenry at all. He coached them just so his grandson would get into sports again instead of grieving the loss of his whole family to a fatal car accident. Ironically, Mr. Henry was put on the spot and had to invent lines on camera. We occasionally go through the same episodes in our life in which, like Jason’s experience, the ideal becomes real. We then see that life is full of hope and color. But all too soon, reality kicks in and kicks us off our high horses much to our dismay. Then it becomes a true test of our strengths and weaknesses. This is where we usually fail as our pessimism blinds us from the lessons we ought to learn. Contrary to Jason’s fear though, the taped interview of Mr. Henry’s lies was not aired on TV. Last-minute editing saved all of them, including the sportscaster himself, from a humiliating assumption they all believed to be true. In lieu of the “lost-and-found-legend” storyline, the custodians’ coaching skill was highlighted in the TV program. The host even commented the Mr. Henry “was, if anything, something more” than McHenry because he “did something the great pitcher never did” — to coach three children to victory over nine presumably better players. What I like best about this book is that it crosses it own borders. It is a tale for the young that also appeals to adults. It is a sports novel that non-sporty types can easily grasp. Beyond its unrestrictive mold, the simplicity of its plot sheds away any literary clutter and delivers only what is essential. The ending is rather unusual for a story about searching. But if we look closely into its consequences for the characters, we can see that it is the better ending for them. Jason went uncovering the truth in a baseball card but he discovered a man. Finding Buck McHenry did not matter anymore because he already found a real hero in Mack Henry. There are very few certainties in the world. Failure is one of them. For Jason, it was an honest mistake out of a dream to bring a legend back to life. For Mack Henry, it was a noble dream to bring a smile to his grandson’s gloomy heart. Lies had been said. Excitement had gone awry. But a fresh discovery of themselves was their prize; a great new team was their bonus. If we will only be a Jason or a Mack Henry in every trial that we face, we can see more growth than breakdowns and appreciate the little nudges from inescapable potholes on our way. Life is a journey with more detours than freeways. Success waits for us at our desired destination but happiness comes to those who make a destination out of every detour. Google announced that it will soon be retiring two of its services: Google Health and Google Powermeter. 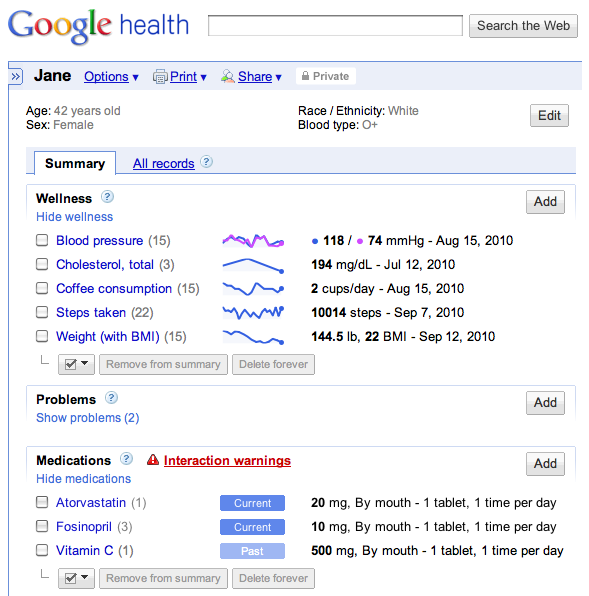 Google Health is an advocacy service to “organize, track, monitor, and act” on an individual’s health information. Being able to store and manage health information enables one to set personal health goals and track progress along the way. 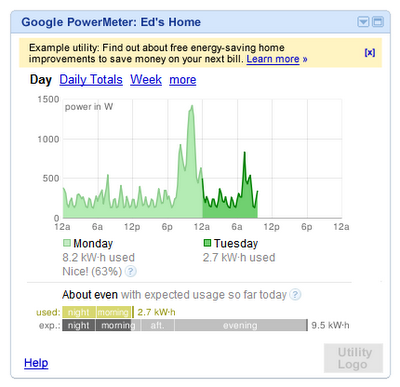 PowerMeter is another free Google service that aims to help saving household energy consumption by providing tools to track energy usage and predict costs.